The skeleton wall is located in the Dodoka Monastery, which is halfway between Sok and Nagchu, on the south of the G317 Highway. This skeleton wall is one of Tibetan’s strangest, least-visited sights.From far, this wall looks like a typical Tibetan mani wall. 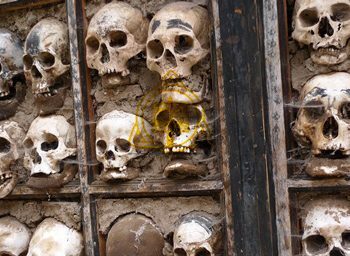 However, instead of using prayer stones, this wall is made of thousands actual human skulls. These skulls are from sky burials carried out within the nearby courtyard. There are only three monasteries in Tibet have ever carried out to display human skulls. The other two are Ridazeng Monastery and Quedai Monastery. All these three monasteries are in Biru County. 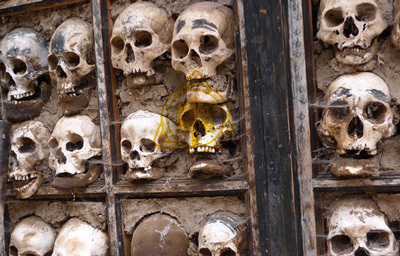 The action of displaying skulls had stopped once during the Cultural Revolution with skull loss, however, in the past 10 years, Dodaka’s monks revived this activity. They put old, recovered skulls into the wall with other ancient skulls. No one and no legend know why these monasteries display human skeletons, but monks said they illustrate these skeleton because they want to tell people no matter what they do or who they are, after death, they are all equal here in this wall.